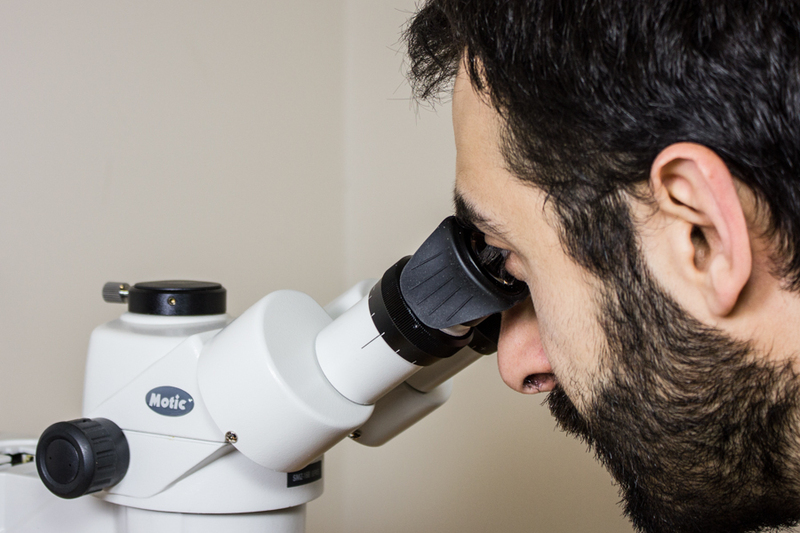 The Tru-Block™ Eye Shields are unusually tall eye shields that fit on your microscope eyepieces and block light entering your eyes from the side. Eye shields folded down – if you can see his eyes, light can get in! 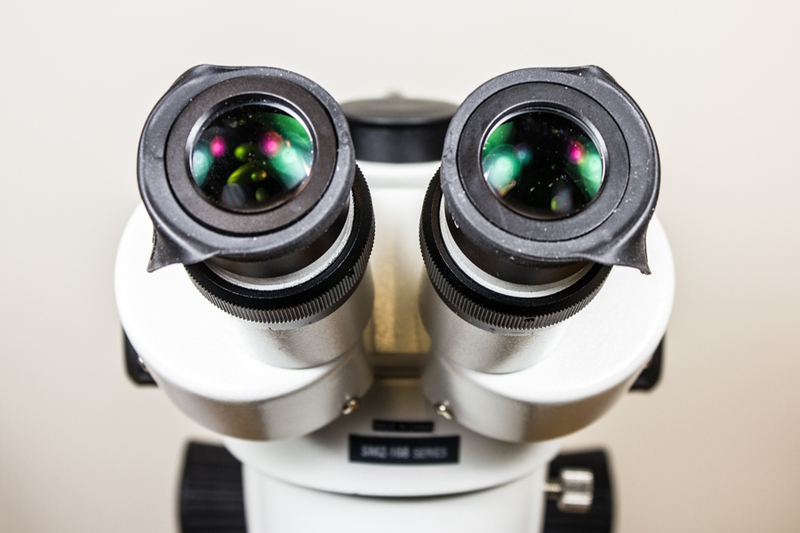 You can see things under the microscope better when there is less interference and distraction from light entering your peripheral vision. 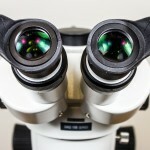 You can observe fluorescence even in well-lit environments when used in combination with the Eclipse MicroTent™. Why did you introduce these? 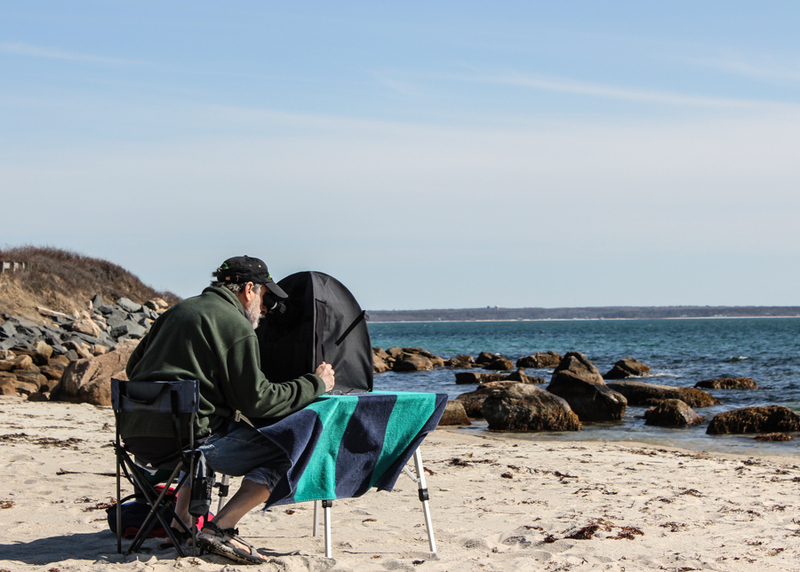 When we were testing the prototypes of the Eclipse MicroTent™ under the most challenging conditions – outdoors in full sun – we found that the limiting factor in being able to do fluorescence work was the light entering the sides of our eyes. Simply holding our hands up to block that light made all the difference. 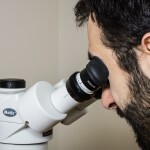 Existing eye cups did not extend high enough to be effective. We experimented with hoods, blinders, and other tricks, but none of these had the right combination of function and convenience. 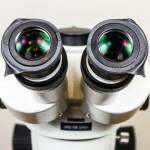 These tall eye shields proved to be the most practical solution. 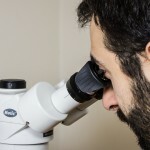 They are also effective when used by themselves for microscopy in general. How do you use the eye shields? 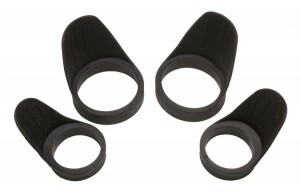 To attach, just stretch the rubber ring over the end of the eyepiece. The eye shields are available in two sizes so that you can use them with or without existing rubber eye cups. If you want them out of the way you can just fold them down to the sides. 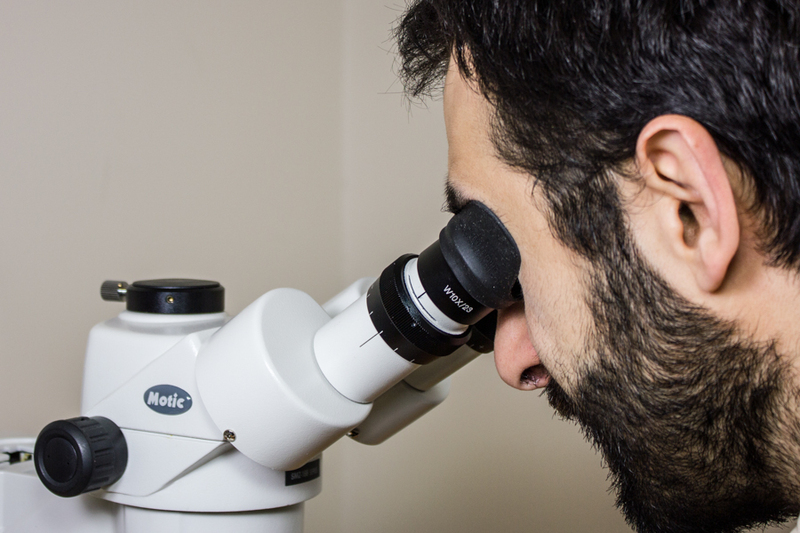 The combination of these microscope eye shields and the Eclipse MicroTent™ give you the freedom to do Fluorescence Everywhere™. 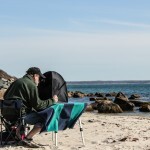 The photograph on the left below shows NIGHTSEA founder Charles Mazel using the Stereo Microscope Fluorescence Adapter, powered by a battery, in combination with the tent and the Tru-Block Eye Shields to do fluorescence microscopy on Nobska Beach in Woods Hole, Massachusetts. 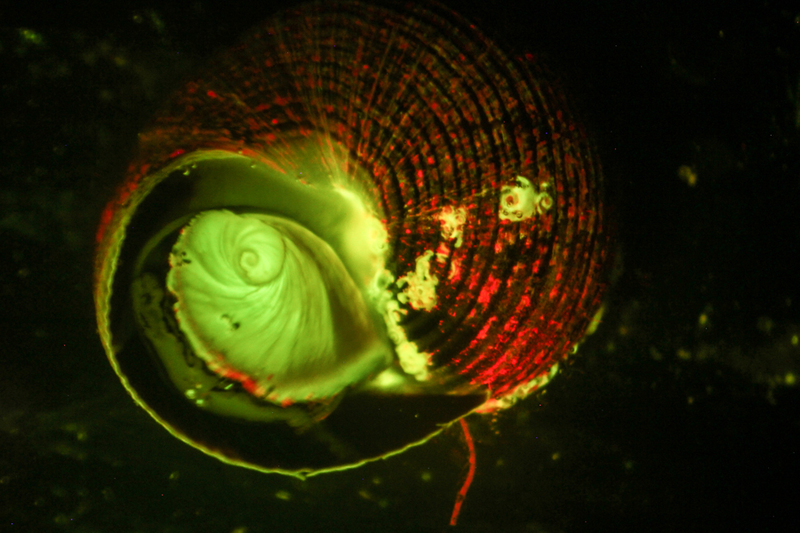 The image on the right is a fluorescence photograph of a mollusk shell and operculum taken using the system – in the middle of the afternoon. 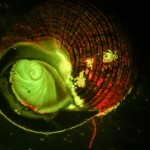 The red fluorescence on the shell arises from chlorophyll in algae growing on the shell. 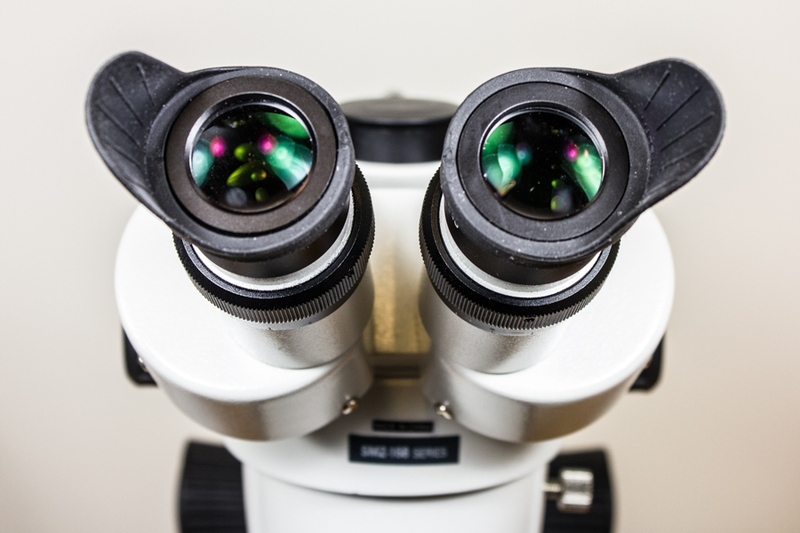 Local microscope dealers – The Stereo Microscope Fluorescence Adapter and its accessories are also available from select local microscope dealers. If one of them referred you to the NIGHTSEA web site for more information, please go back to that reseller to place your order.